Hi, I’m not sure where march has gone, like a lot of other people I know, I have spent part of it ill, not flat on your back can’t move ill but generally sore throat, blocked nose can’t get up the enthusiasm to do any thing ill.
We, that is Simon and I have spent the last week at home on leave, we began our ‘holiday’ by visiting my Sister in Derbyshire, I think it was Simons excuse to drive his new car or an excuse to see my niece who turned two the beginning of the month. It was a lovely weekend, we arrived late Friday night, and sat up talking for a couple of hours, then up early Saturday morning, my niece was a bit snuffly and cuddly, but apparently that is best for cuddles. we took her present with us, as soon as she saw The Gruffalo’s Child DVD she lost total interest in anything else and toddled off to the living room to put it on. We went to Calke House for lunch, if you like stuffed animals it is a must see, there are lots of other things to see but I thought it particularly sad at the state the upper floors had been allowed to get into with peeling wallpaper and blown plaster, the weekend we went they had a lambing day, Simon was over the moon, apparently he loves lambing. The rest of the week we have spent throwing things away and tiding up, Monday I threw out six bags of rubbish and Wednesday we took about 15 bags of stuff to the local charity shop. The upshot of this week is that we are both happier with the state of the house and I nearly have a new cutting table. 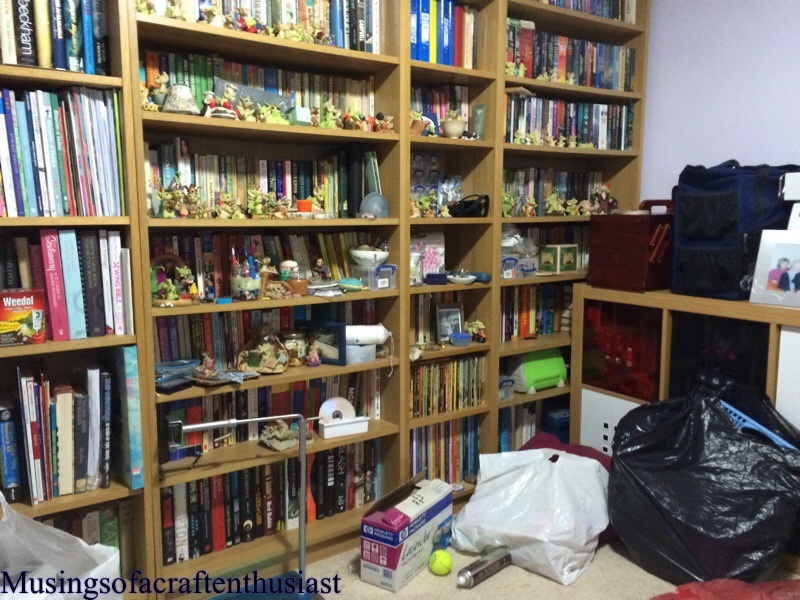 I’ve discovered that the older I get the less inclined keep stuff I am, a lot of the things that have been removed from the house this week a couple of years ago I was adamant that I couldn’t do with out them, now I can’t wait for them to go. 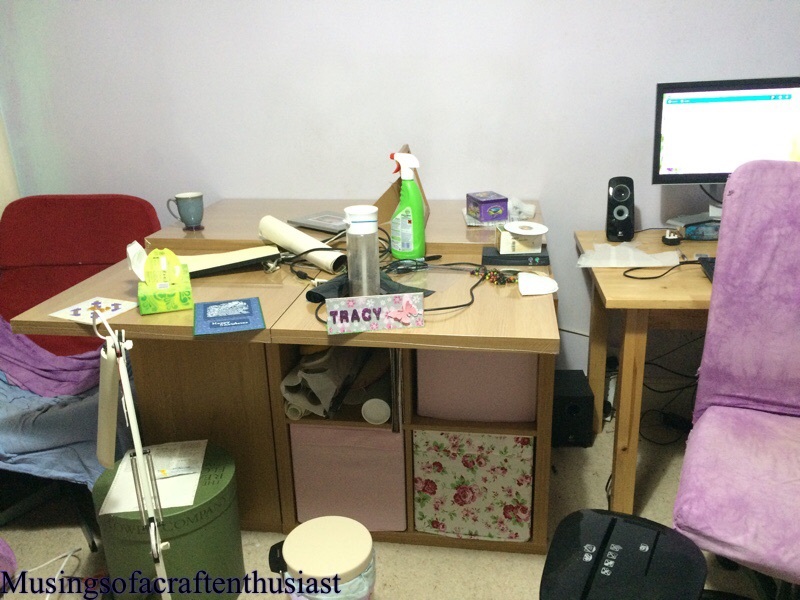 The upshot is that I lost one chest of drawers and a computer desk and gained a cutting/ sewing table. 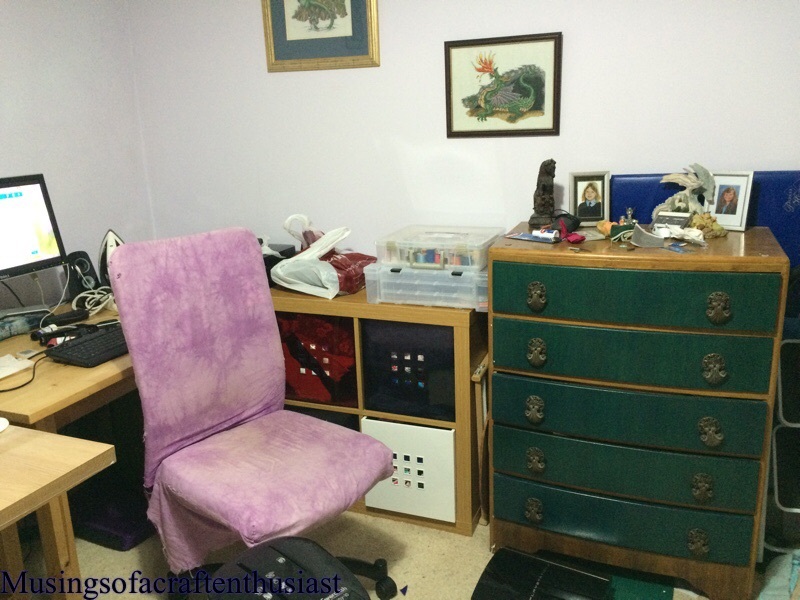 taken apart my expedit units, the 4 hole unit sitting next to the table and the 8 hole unit sitting on its side were the sewing table used to be, my new cutting table is taking up the space emptied by the chest of drawers. 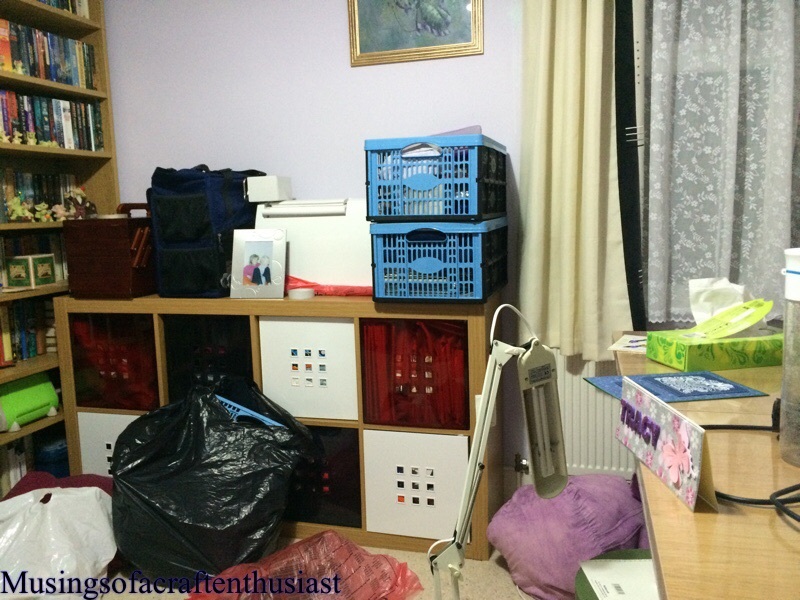 Although it has just as much furniture in it, the room now has more storage space and because it is all lower the room seems bigger. Fluffy is making use of the extra carpet to put fur over a lot bigger area..
As you can see by the black and pink bags, I’m still tidying up. 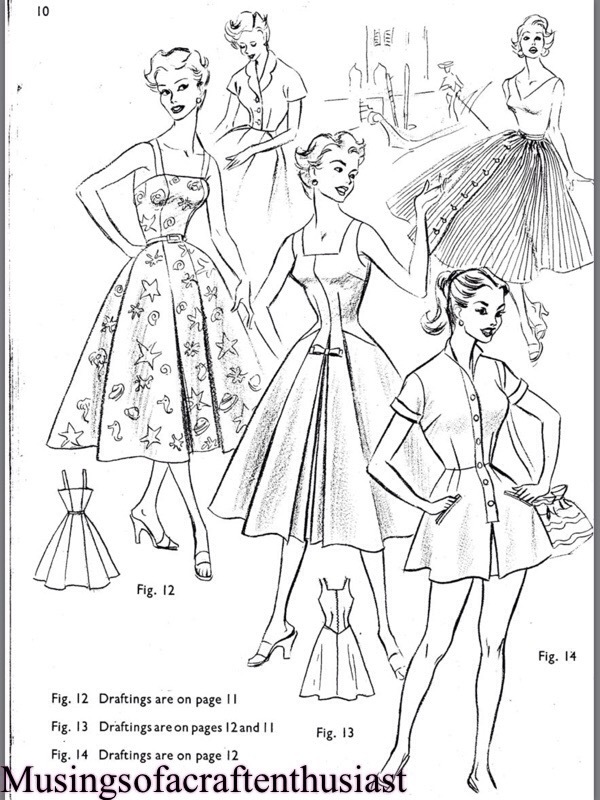 I’m hoping to actually get some sewing done soon, it might just be a another Gerties Shirtwaist dress but it would be good to get something done. What about you, are you less attached to things the older you get? We are going to see Mickey Mouse…. It is booked!!! two weeks in May, in Florida I can’t wait, we have a villa, the park tickets, we are swimming with dolphins, just as well we also have another week off after we get back we will be exhausted!! The main reason for this post is ‘We’re going to see Mickey!! !’ and I need to think about my wardrobe. The temperatures are going to be between 22 and 32 degrees, I’m hoping for the middle to lower end as Simon does not do heat very well. I’m hoping to create one new item of clothing a week until we go, this might be ambitious as a couple of things I have my eye on are in my Haslam books and as I haven’t completed one of the designs yet I can’t say with any certainty that it will fit properly. 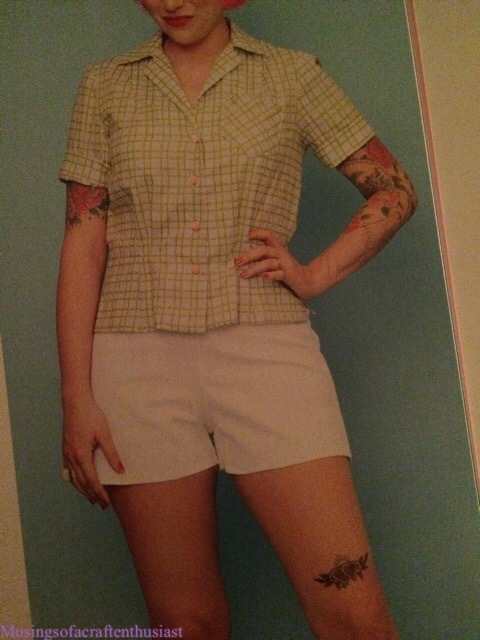 As well as Gerties book for better sewing I have Gerties Vintage casual, I’ve been looking at the shorts, dresses and shirts. Here are some of the clothes I hope to be able to finish before we go. 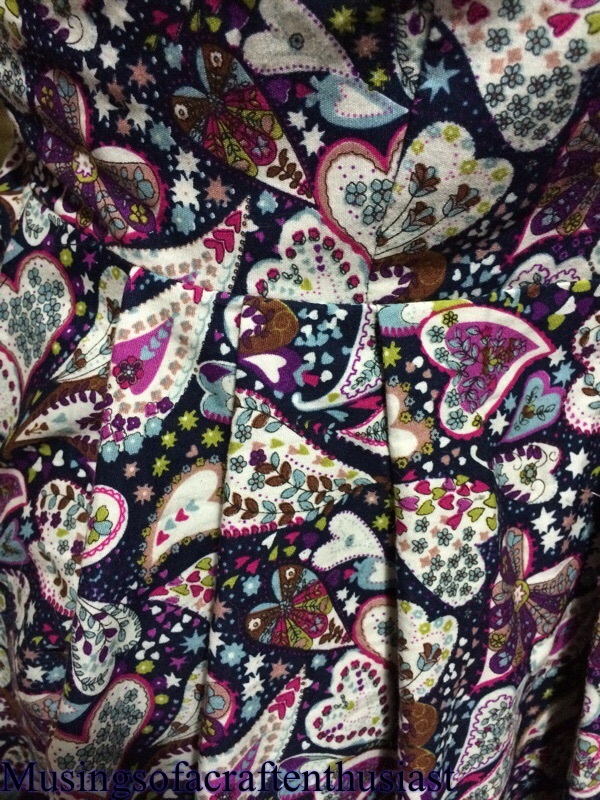 This is a story about a pattern, it is a poor pattern and it had two missing pieces the back and the front 😦 however it did have all its facings and kimono sleeves 🙂 It was also a butterick pattern, of which you might have noticed I have rather a lot of and “some of them” have kimono sleeves. 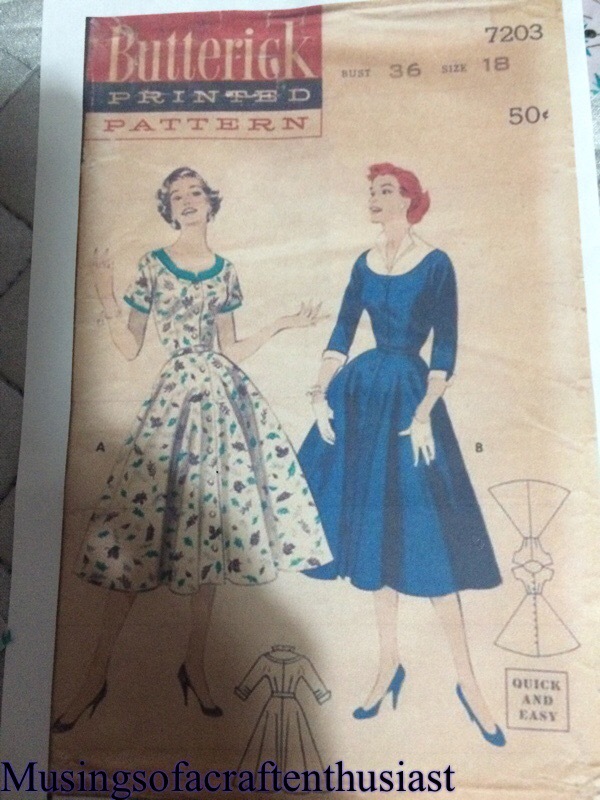 I have recreated my front and pack pieces using one of the other patterns and the facing bits, I not quite sure how the bodice facings go together but I’m sure I’ll work it out. I am using a cotton fabric, it might be Lawn as it is thinner than the poplin I usually buy, I really will have to start marking the fabric up as I buy it. It is white with green flowers on it. The skirt pieces are self-faced while the top has a separate facing piece. 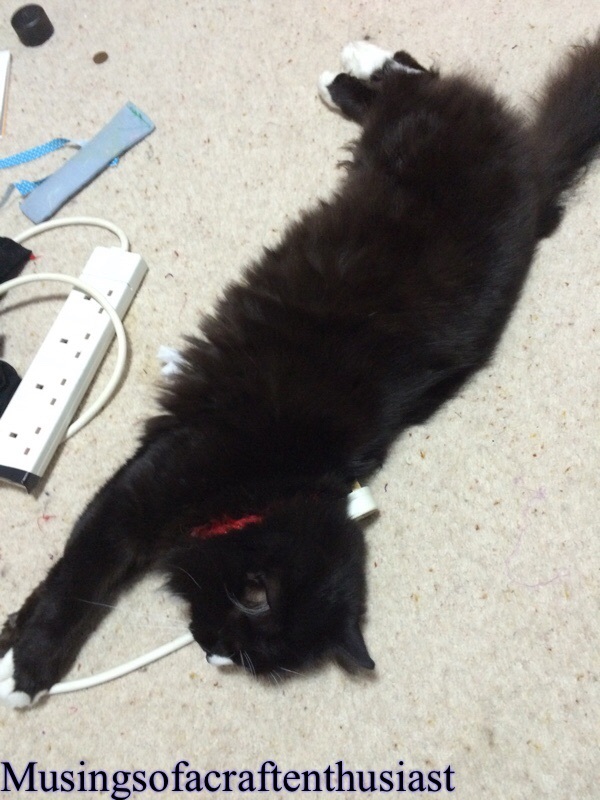 I didn’t cut out the interface at the same time as the rest of the dress as the kittens were being a bit of a nuisance, I’ve now cleared my craft room door so that I can shut them out, they aren’t particularly happy about it, but tough. 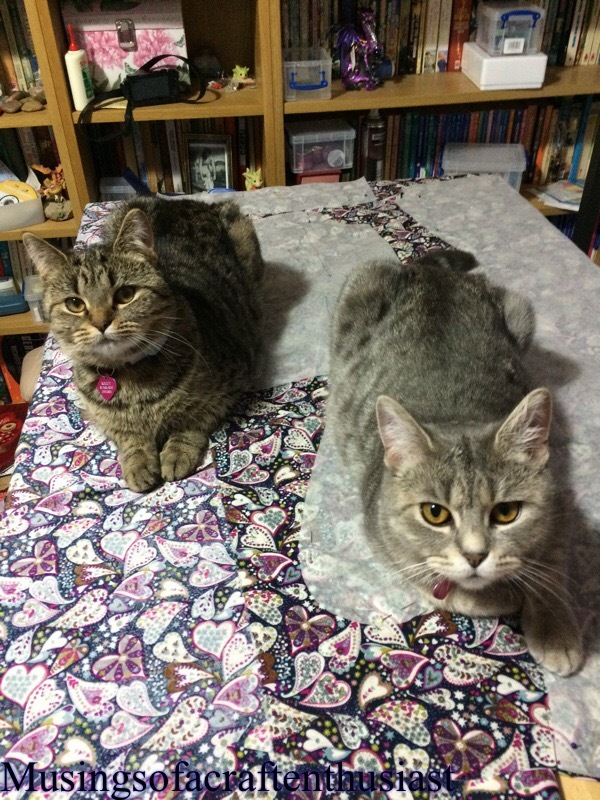 It is very hard to cut out a pattern when three of them are sitting on it. 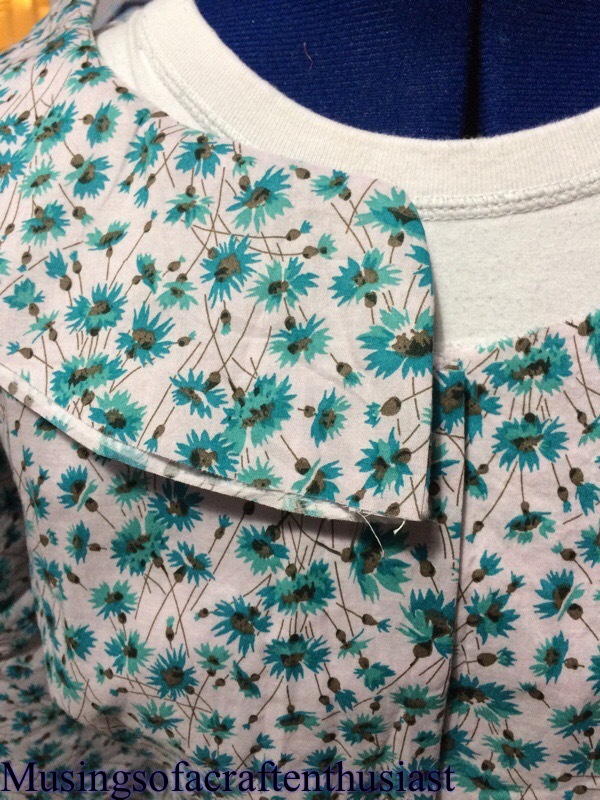 I’ve so far done the skirt seams the underarm seam and attached 90% of the top to the skirt, (why 90% I hear you say) because I’m a very disorganised when I stitch, and the other pieces need interfacing which as I pointed out earlier I haven’t cut out yet. 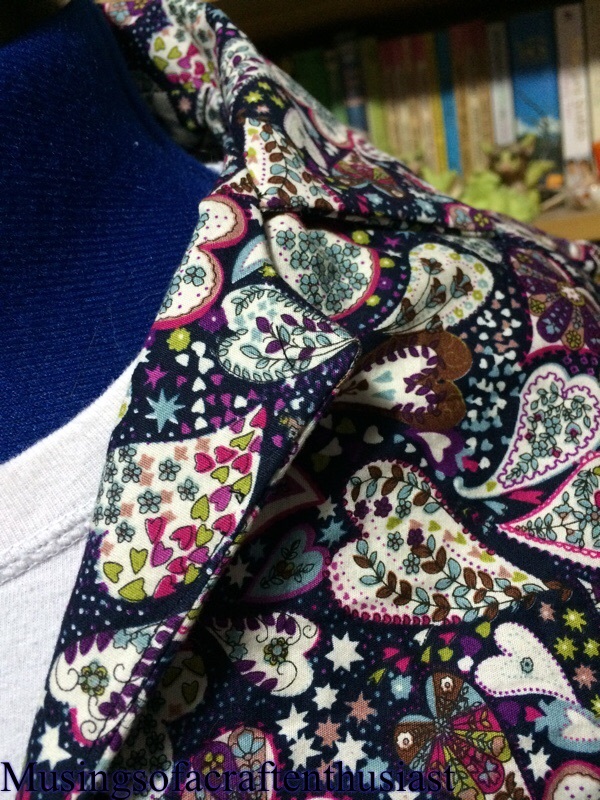 I have tried to iron on the interfacing after stitching an item together, it is not something I recommend, even if it is a simple piece, like a front facing for one thing the stitches are now under the interfacing and it didn’t iron on quite as smoothly as I would like. 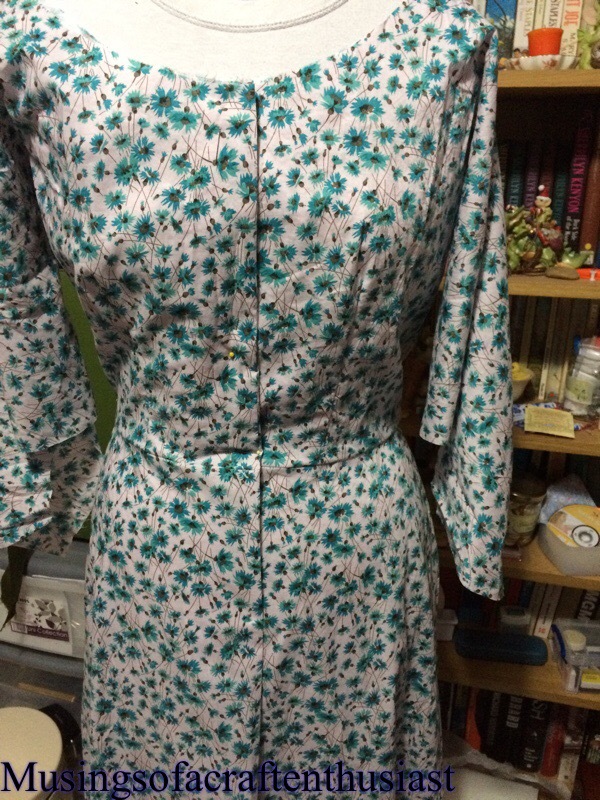 I have made another Gertie shirtwaist dress, which went together slightly better but that could have been because I made a straight size 6 (US) instead of grading between 4-6-4, the first dress was a little tight across the top of the bust so I figured the larger size would be fine and as the skirt has so much material in it extra over the hips I felt that an extra size wouldn’t make a difference. I do think that there is a slight drafting issue, I don’t know if it affects all the sizes but it does affect size 6, If I had used the notches on the shoulders the top would have been a very funny shape. 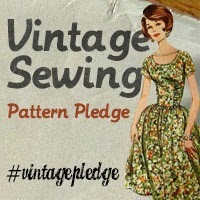 Denise will be glad to hear that the pleats gave me almost as much trouble the second time round as the first. At least I knew what it should look like this time!! I don’t know what I was doing but with the first side, it didn’t matter how I folded the pleats I had two together and one by its self, it wasn’t until I folded the other side I managed to get it to sit properly, I still don’t know what I was doing wrong on the first side. 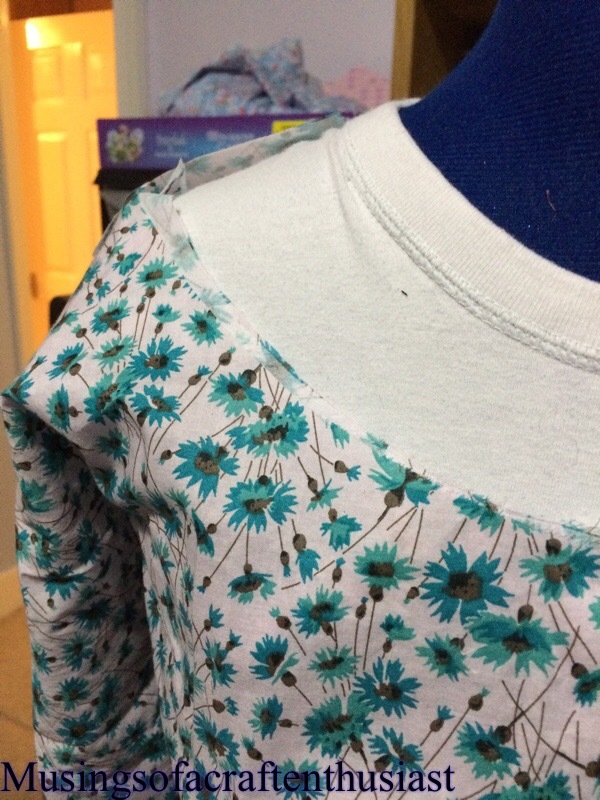 I needed to fudge the shoulders otherwise the collar wouldn’t fit, I pinned the collar at the notches and the shoulder seam, which left me with almost an extra inch and half of top fabric more than collar. 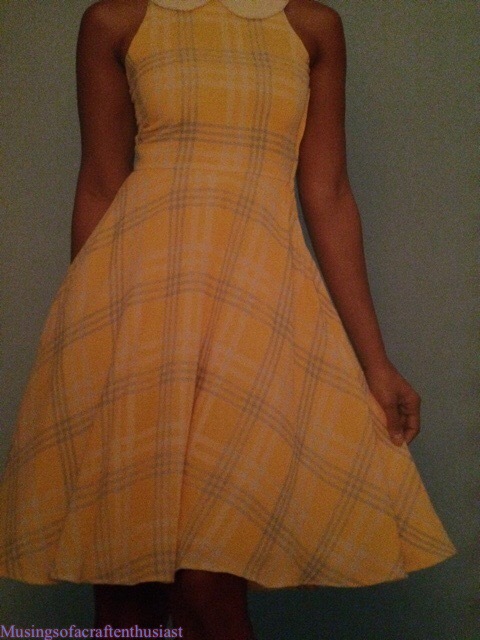 If you make this dress, I suggest you check the front skirt facing is long enough and that the pleats fold in a nice easy three pleats together and the top dart lines up with the first pleat.